Every day, particularly towards the Southern end of Jomtien beach the Thai fishermen gather to sort through their nets, refuel and prepare their boats around 4 pm in the afternoon. They're night fishermen so they set off towards the horizon and many can often be seen from afar throughout the night, by the neon lights they use to attract the squid. 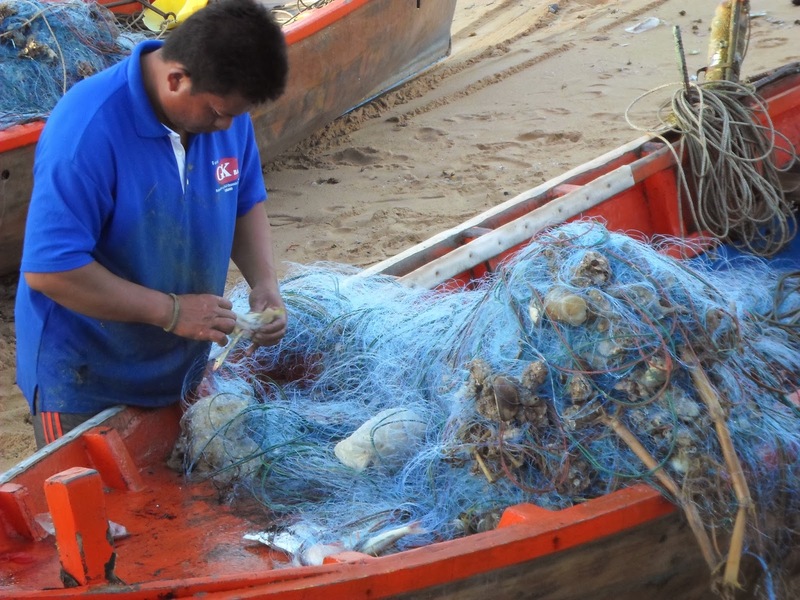 Even during stormy weather the fishermen are to be found at work. 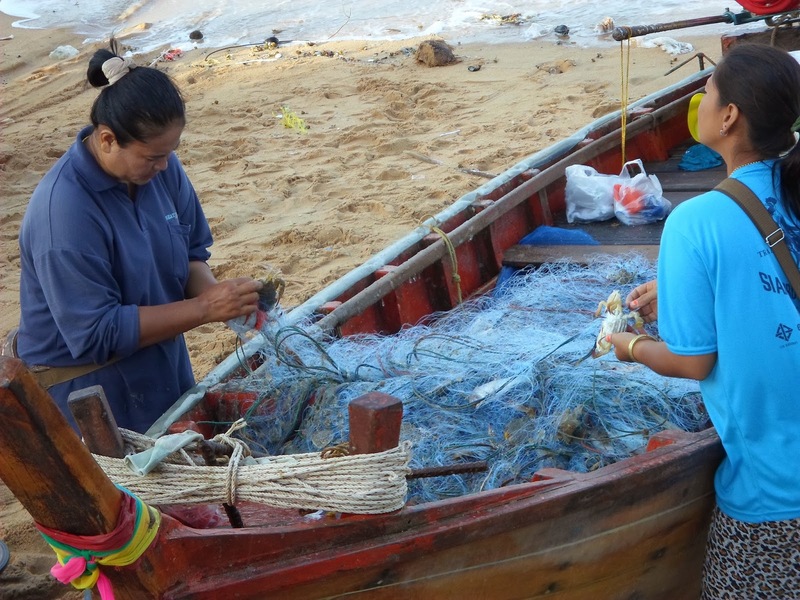 They have been seen to scuttle back to safety at three in the morning in order to avoid a particularly savage storm, but invariably the Jomtien fishermen and women can be found coming towards shore between 7 and 8 am. 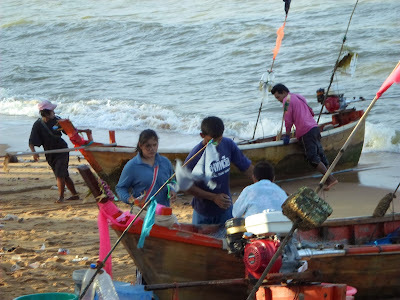 During this time locals gather to buy fresh fish, crab and squid. If you really feel like eating al fresco there's a steamer available in some spots to eat the delicious seafood straight from the Gulf of Thailand. The boats above are mainly crab and fish as they do not have the booms that support the neon lights for squid fishing, and they somewhat smaller. 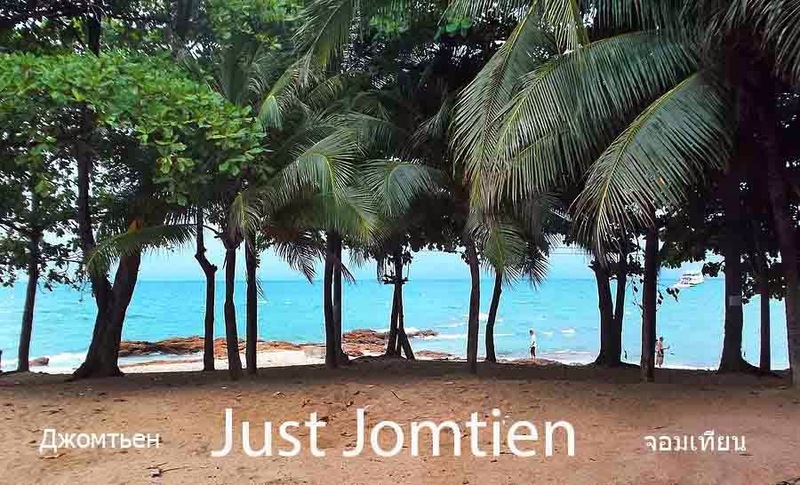 If you do decide to sample Jomtien Beach seafood fresh from the sea don't feel shy to barter( in a friendly manner or you wont succeed) or just wait a little while to see what price the locals are paying. The word for a kilo is 'lo'. Lo nung is one Kilo, Kreung lo is half a kilo and Song lo is two kilos. Thank you for sharing valuable information. Nice post. I enjoyed reading this post. The whole blog is very nice found some good stuff and good information here Thanks..Also visit my page. myrtle beach fishingWe have the fastest Charter boat in the area, which translates to more fishing time for you! well, If you really want to travel to a good place then i will suggest you to get your own Yacht and go for a long drive on North side of America or Niagra falls. You can get the boat from SOV yachts.